Upstate New York Flood Relief | Aurora Shoe Co. While our friends along the East Coast were relieved to see that Hurricane Irene's force had softened, our friends in the Southern Tier of Upstate New York were hit with flooding that has devastated their region. High flood waters are reaching historic levels and leaving many families homeless and desperate for assistance and actual physical help with the difficult work of salvaging and rebuilding. What can you do to help? 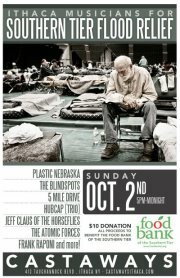 If you're local you can gather with our friends in Ithaca at the Ithaca Musicians for Southern Tier Flood Relief event at Castaway's on Sunday, October 2nd. All proceeds will be donated to Food Bank of the Southern Tier. We'll have a pair of shoes up for auction and would love to see you there. Too far away to join is in Ithaca? In addition to the shoes we've donated to the October 2nd event, we've also put 5 pairs of shoes (any color, any style) up for auction* on Ebay. You can bid on the shoes here and know that your money will not only be putting new handmade shoes on your feet. It will also be on the ground, helping those who need it desperately and who also happen to be just an hour's drive away from us here in Aurora. Thank you for any help you can provide. If you have any other worthy organizations in mind, or have other ideas about how we can all work together to help the flood victims in the Southern Tier, please share them in the comments box. *We're getting creative in our attempt to put all five pairs of shoes up under one Ebay auction. We'll send shoes off to the top five bidders in this single auction. Winners will choose their favorite style and color, and of course, we'll work with you to get the sizing just right.